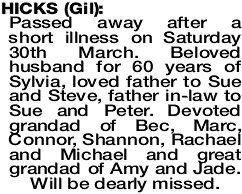 Passed away after a short illness on Saturday 30th March. Beloved husband for 60 years of Sylvia, loved father to Sue and Steve, father in-law to Sue and Peter. Devoted grandad of Bec, Marc, Connor, Shannon, Rachael and Michael and great grandad of Amy and Jade. Will be dearly missed.